Valentine's Day is almost here, about two weeks away! 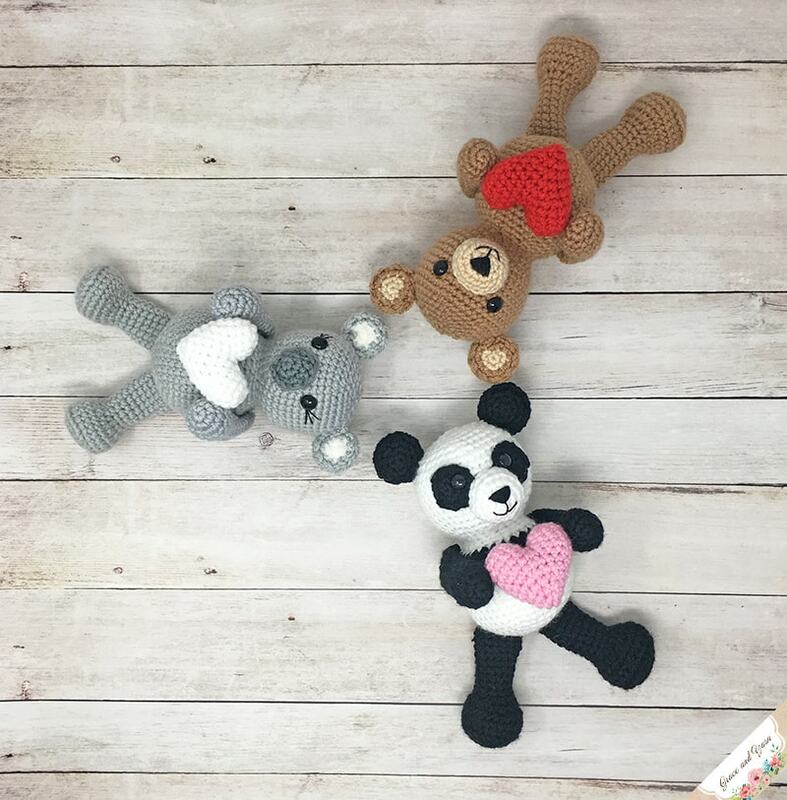 To be honest though, these bears and koala can be made anytime of the year with or without their little stuffed heart. These were made with inspiration from the little stuffed animals I remember from when I was little. The ones that would sit on the shelf holding a heart, some would sing a tune and some were just stuffed cuteness. 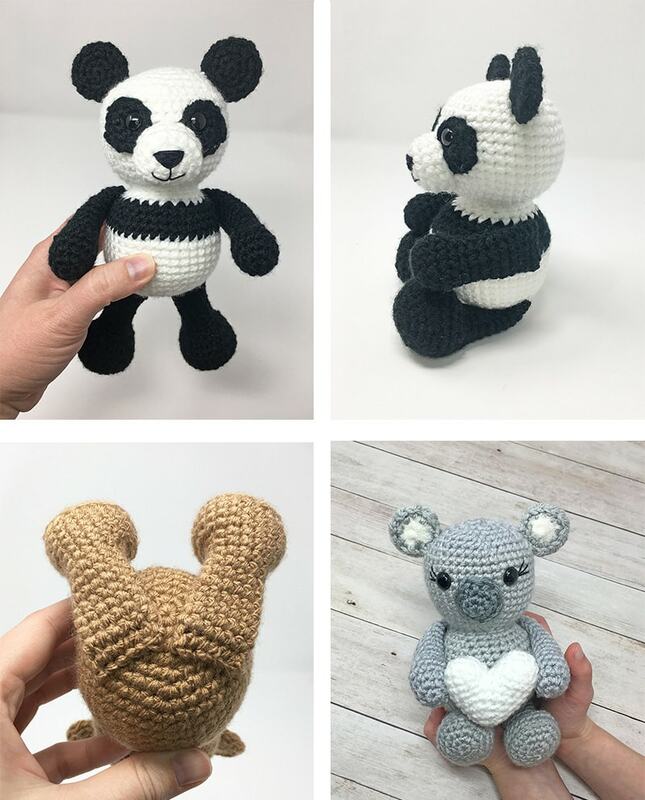 When I made the brown bear I also noticed that with slight changes we could have a super cute panda and koala all in one pattern! The head and body are made as one piece, be sure to stuff the neck firmly and you won't have any problems with a wobbly neck. I've also kept it at a nice width to help support the head. Feel free to make yours in a boy or girl version. If you'd like to add a bow this one from our Mini Pig should be the perfect size! Could also serve as a bow tie for a boy! 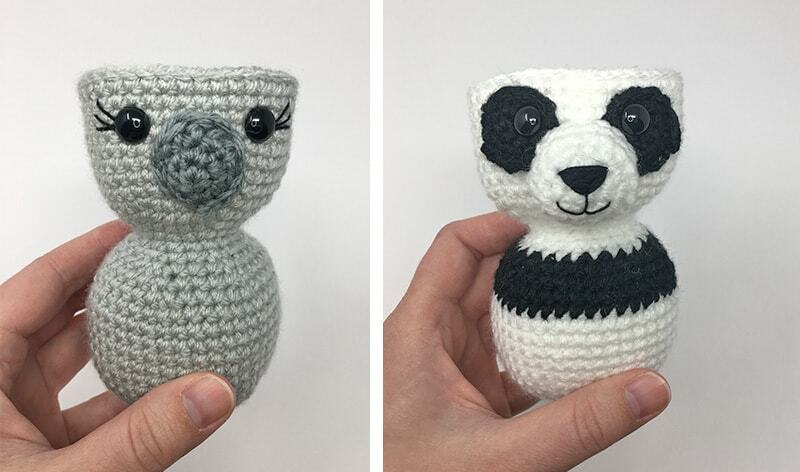 If you're new to amigurumi check out our tips page to get started! The Grace and Yarn Crochet Group on Facebook is also a great place to ask questions, plus share your works of crochet art! 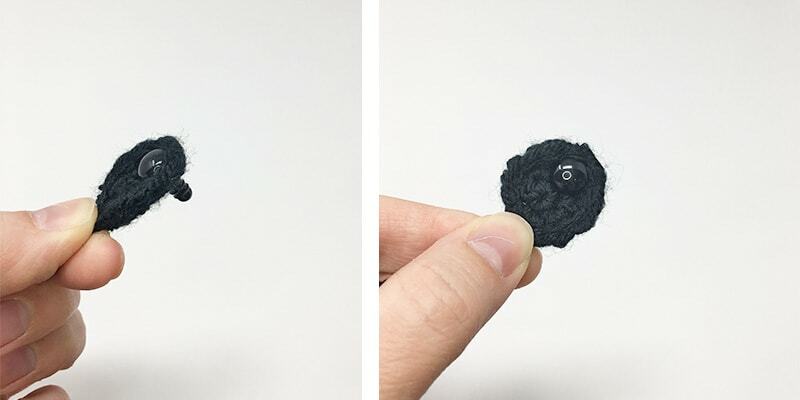 I've used plastic safety eyes in this pattern but if you'd prefer an alternative, these are my favorites! Be sure to also sign up for our newsletter, I'll keep you updated when new patterns and tutorials are posted! 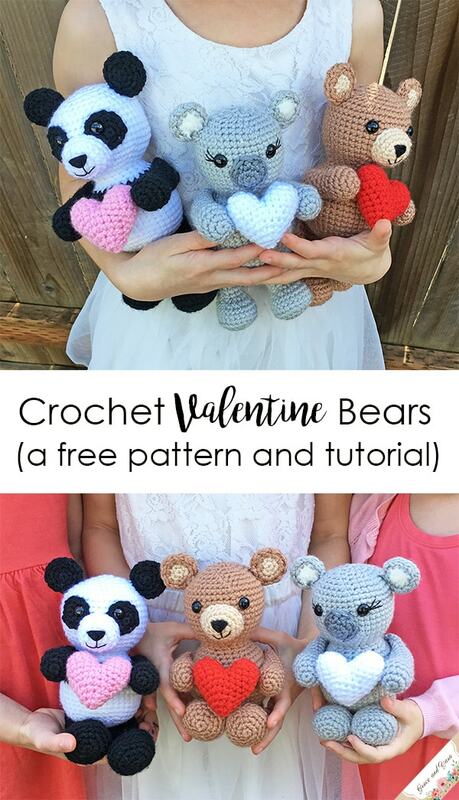 Notes: This pattern and tutorial will include directions to make a brown bear (or polar bear), panda bear and koala. Each Valentine Bear measures about 5 inches tall in a sitting position. *You will want to slowly stuff as you go, you want it to be firm but not stretched. 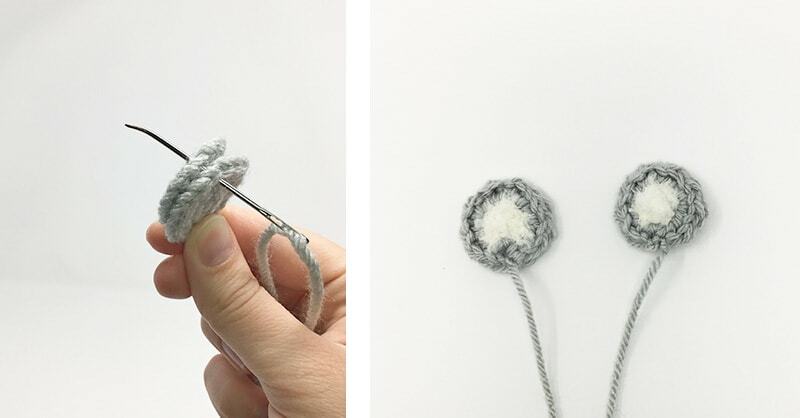 You will be working in the round, I like using a stitch marker at the beginning of each round. For this pattern the body and head will be made as one piece. Fasten off leaving a long tail for sewing. With your crochet thread (or yarn) make a triangle and smile as pictured above. To make the nose I made a ‘V’ and closed it at the top to create the triangle. Next, fill it in to be solid. Fasten off leaving a long tail for sewing. You will place your safety eyes towards the last round as pictured. The body and head for the brown bear and koala will be the same color throughout. I will have a note in parenthesis below for the color changes if you are making the panda, which we will start with white. Note: Here is where we will add the facial features before we start closing the head. Insert the eyes between rows 29 and 30, 6 stitches apart. Optional Note for Brown Bear and Koala: Place your eyes where you would like them and then remove to embroider your eyelashes before attaching the washer to the back. (This creates a little hole to help see where you want your eyelashes to go). Note for Panda: Place your eyes through the eyepatches and then into the designated stitches on the head. I then sewed my eyepatches into place before securing the back of my eyes. Next sew your nose centered between the eyes adding a little bit of stuffing as you go. You will need a front and back piece for the brown bear and koala. For the panda you can make each ear with the instructions for the back piece as a color change will not be needed. Use brown for the brown bear, grey for the koala and black for the panda. At the end of round 15 pinch the arm flat and make 5 SC across the top to close, fasten off and leave a long tail to sew onto the body. Make 2 with the same colors used for the arms. I stuffed the foot firmly and left the legs unstuffed to allow the bears to sit more easily. At the end of round 18 pinch the leg flat and make 6 SC across the top to close, fasten off and leave a long tail to sew onto the body. The heart is made with two pieces joined together. Make two pieces using rounds 1-4. At the end of the 2nd piece do not fasten off, proceed to round 5 to join them together and make the body of the heart. Slowly stuff as you go. 1. Sew the ears onto either side of the head, starting at the 5th round and ending at the 7th round. 2. Next, sew on the arms. I angled my arms slightly forward and they covered rounds 13-17. 3. Sew the legs onto the bottom of the body, making sure to keep them centered with the facial features. 4. Lastly, sew your heart to each hand. Your sweet Valentine is complete! I hope you enjoyed this pattern, thanks so much for stopping by! Thank you so very much for your generosity sharing your bear patterns. They are adorable. Especially love your dog with his coat and booties! Too cute! So cute!! Found you from the HOHD post!